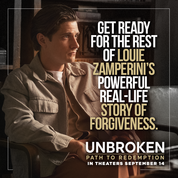 I am happy to say Carmen Van Deursen is the winner of the two Fandango tickets to see Unbroken: Path to Redemption (You'll find my review at this link.) Thank you Carmen for reading grandma's cookie jar (please email me at lyndagcj@gmail.com, so I am able to send you your ticket codes) and thank you Flyby for making it possible for me to review this movie and give tickets away. It is Chocolate Milkshake Day! grandma's chuckles - My "Grandma Power"